For us, it's all about the animals and helping them find the lives they should have! Our largest annual fundraising event, the Canine Carnival has grown significantly each year with more than 19,000 people and 130 rescues and vendors of animal goods from as far away as New Jersey attending. Hundreds of animals have been adopted, and we’re excited to make the upcoming years even better. Visit the dedicated Canine Carnival page for more information and current updates! Partnering with the Syracuse Crunch hockey team always makes this event wildly successful and enjoyable for the whole family! 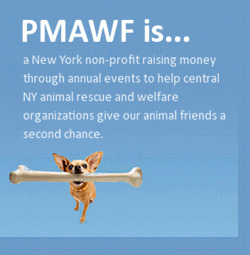 Proceeds go to several participating animal welfare foundations, head up by PMAWF.